NINJA ASSASSIN: Ninja, Please… – Schlockmania! No one was more pumped up for a new ninja epic than me. I’ve loved martial arts-themed anything since childhood. With the supernatural/comic-book angles of their mystique, ninjas held a special level of interest for me, to the point that I used to draw elaborate battle scenes of ninja armies fighting each other during my elementary school years. Ninja Assassin added further appeal by casting Sho Kosugi, star of countless 1980’s ninja-thons like Revenge Of The Ninja and 9 Deaths Of The Ninja, in a major role. With a protege of the Wachowski Brothers directing and a respected sci-fi author (J. Michael Straczynski) co-writing the script, it couldn’t miss, right? Think again. 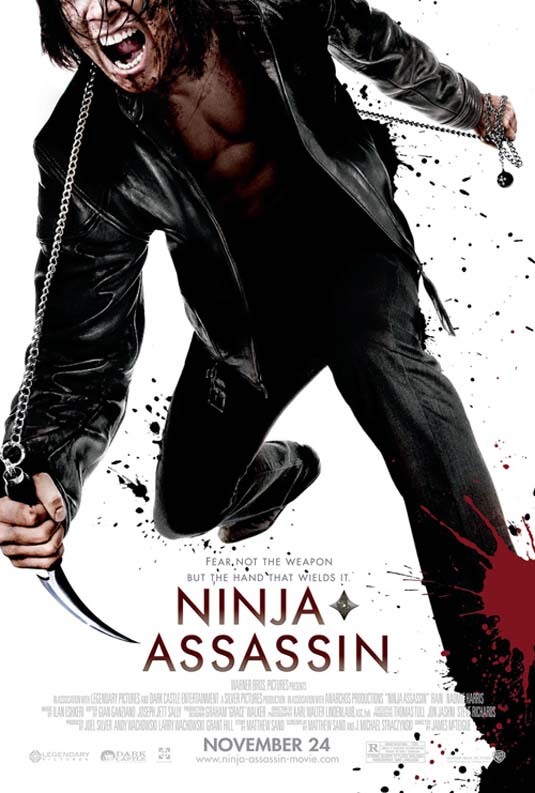 Ninja Assassin takes a promising setup and spends its time taking it in all the wrong directions. The opening scene reveals that a clan of ninjas are killing crooks on a for-hire basis. Things start to go wrong with the introduction of (*groan*) a plucky young Europol researcher (Naomi Harris), who pieces together the ninjas’ story and thus ensures that she and her law-enforcement brethren are destined for ninjitsu-style slicing & dicing. Her only hope is Raizo (Korean pop star Rain), an escapee from the ninja clan. His past traumas roll out in flashback form as he labors to protect the heroine and gears up to the settle the score with the clan’s brutal leader, Ozuno (Kosugi). Unfortunately, the script handles these elements in a terminally bland manner and worsens things by grafting on mass-appeal elements that just don’t work. The real story is the clash between Raizo and Ozuno but it is forced to take a backseat to the Europol plot thread, which offers cardboard-thin characters and is dull enough to inspire narcolepsy. The flashbacks to Raizo’s training work in classic martial-arts flick style but even these get derailed by the introduction of a love interest (?!?) in scenes filled with cringe-inducing, unintentionally hilarious dialogue about love and the nature of the human heart. The script also features dumb ideas like having gangs of ninjas who whisper and mumble when they emerge from the shadows. On the plus side, there are two very good performances by Rain and Kosugi. Rain offers a nicely stoic presence and handle the physical demands of his heroic role with ease while Kosugi brings a gravitas and sense of dramatic depth to the villain role that this film really doesn’t deserve. Unfortunately, they have to share their time with the boring crime-investigation stuff, which is anchored by a so-bland-it’s-barely-there performance from Harris. However, the final nail in Ninja Assassin‘s coffin is the all-flash, zero-substance direction from James McTeigue. He gives the film the expected visual gloss but is way too reliant upon digital imagery to achieve his desired effects. There appears to be some decent choreography in the fight scenes but each setpiece is slathered with a ton of unnecessary, cartoonish CGI: sickles on chains fly out at the audience in a 1950’s 3-D style and slashed ninjas erupt in welters of neon-bright digital gore that resemble Hi-C Tropical Fruit Punch. The filmmakers forgot that the pleasure of any sort of martial arts film comes from seeing fights and magical derring-do that are really happening in front of the camera. What we get in Ninja Assassin is so digitally polished and reworked that it feels like you are looking over someone’s shoulder while they play a ninja video game. There’s also the usual crappy fast editing that drains all the visual intrigue right out of a fight. In short, if you want a ninja fix, you are better off turning to the classics. Ninja Assassin expends a lot of crash and flash but never quite delivers the goods. Previous ArticleMelody Plus Muscle: What Exactly Is AOR Music? Thanks for the heads up on this one. You saved me from spending hard-to-come-by cash. I will check it out for shits and giggles, but it sounds like Netflix is the way for me.